Whether your transit agency seeks to increase or control ridership, MTM can provide the scheduling and dispatching support you need. We provide a multichannel contact center environment with flexible solutions adaptable to your agency’s needs. Our highly trained and professional Customer Service Representatives deliver passenger-focused service that provides a friendly voice for your customers and reflects positively on your operations. With state-of-the-art customer service systems, MTM transforms passenger interaction into a multichannel experience that can be customized to meet specific needs and criteria. From a proprietary application that allows passengers to request transportation services from their mobile device, to web chat, text, and email functionality, our contact centers go beyond the just a traditional call center operation. However, while many passengers today desire on-demand online functionality, MTM still realizes the importance of traditional voice-to-voice interaction. As a back-up to online services and as an added convenience for passengers who prefer phone contact, our Customer Service Representatives are available on a 24/7 basis to provide personalized communication with riders. These results are a direct reflection of not just our technological capabilities—but the friendly, helpful representatives who provide caller-centric engagement for every customer. The customer service industry is traditionally a high turnover environment, with contact center attrition hovering around 33%. 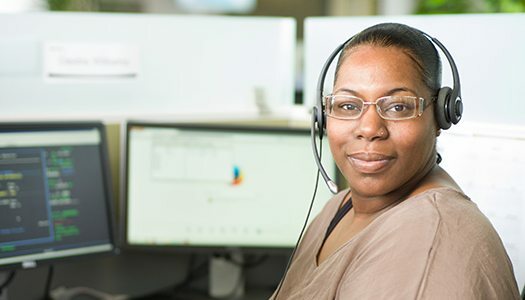 With a culture that focuses on employee engagement and support, MTM is proud to maintain one of the lowest turnover rates of any transit contact center—including a 90-day attrition rate of under 3%, a timeframe that typically results in extremely high turnover as employees realize they are not the right fit for the job. For our clients, low turnover directly correlates to a better customer experience and decreased overhead costs associated with hiring and training new staff. Not everyone is cut out for the customer service environment—our representatives must be reliable, flexible, driven, and able to cope with stress and difficult callers. Our Talent Acquisition team thoroughly screens all staff over the phone and in person to ensure they align with our core values and are an excellent fit with our culture. Our training program consists of two weeks of classroom and side-by-side training, followed by four weeks of close monitoring in the actual contact center environment. 99.33% of our customer service staff report that they feel prepared for their job following training, leading to more knowledgeable employees capable of providing an efficient, friendly customer service experience. MTM avoids the glass ceiling associated with contact centers by regularly promoting Customer Service Representatives from within. Our ongoing training and development opportunities ensure staff can move through our tier levels, be promoted to specialized teams, and pursue a future in leadership within our organization. Our corporate culture is focused on wellness, work-life balance, and making a positive impact on our communities and beyond. We offer generous benefits, including on-site gym facilities, insurance and 401k plans, paid holidays, community service opportunities, and more to keep staff engaged in their career.